Its the season for grapes! 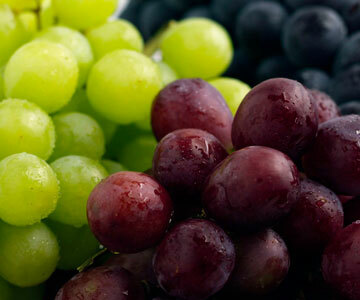 Grapes are rich in antioxidants, Vitamin C and B6, and thiamin. The good news is that not only can you eat it to your heart’s content but also use it to make some excellent cleansers and masks. I’m listing for you some very simple and absolutely easy to make cleansers and masks. 1. Take seedless grapes, cut them in half and apply the juice all over your face and neck. Avoid the eye and mouth area. Leave it on for about 10 minutes. Wash with warm water. This cleanser will help your skin breathe! 2. Take a cup of mashed grapes, add 1 tsp of olive oil to it. Add 1/2 tsp of either salt or baking power and 1/4th cup of milk to it. Pour in the blender and mix it well. Use this to wash your face in the mornings. Wash with warm water. Your skin will glow with regular use. Please store this mix in a cool and dry place. This is an excellent cleanser and can be used for all skin types. Mix the grape, lemon and mint juices together and apply on your face. Leave it on for about 20 minutes. Rinse with tepid water. Now, mix the ice and rose water together and apply it to your face.